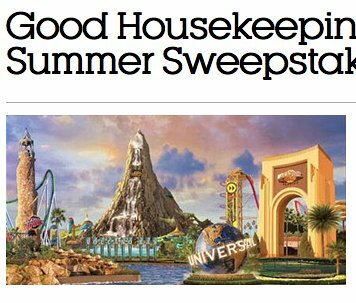 You can win a $4,356.94 4-day/3-night trip for 4 to Universal Orlando resort in Orlando, FL; transportation to/from airport/resort; 3-Park 3-day Park-To-Park theme park tickets for admission to Uniuversal Studios Florida, Universal's islands of Adventure theme parks, and Universal's Volcano Bay water theme park for 4 people; and admission for 4 to a Blue Man Group show. Trip must be completed within one year. 4-day/3-night trip for 4 to Universal Orlando resort in Orlando, FL; transportation to/from airport/resort; 3-Park 3-day Park-To-Park theme park tickets for admission to Uniuversal Studios Florida, Universal's islands of Adventure theme parks, and Universal's Volcano Bay water theme park for 4 people; and admission for 4 to a Blue Man Group show.